Sunday May 3rd 1925 Went to S S and church with Ott & George Bremner. Home with Hattie to dinner. Birdie came last night. They brought me home. Evening in my room. 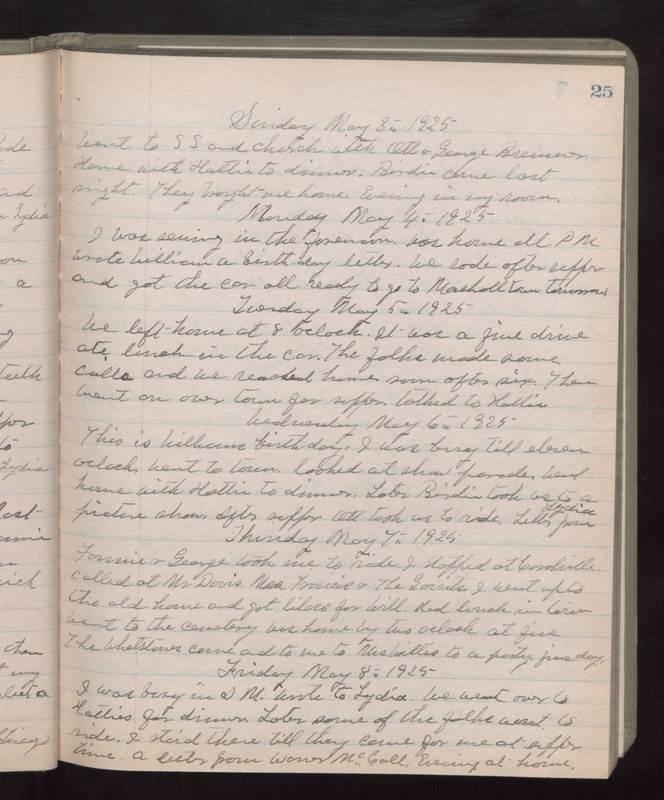 Monday May 4th 1925 I was sewing in the forenoon. Was home all PM. Wrote William a birthday letter. We rode after supper and got the car all ready to go to Marshalltown tomorrow. Tuesday May 5th 1925 We left home at 8 oclock. It was a fine drive, ate lunch in the car. The folks made some calls and we reached home soon after six. Then went on over town for supper. Talked to Hattie. Wednesday May 6th 1925 This is Williams birthday. I was busy till eleven oclock. Went to town. Looked at show parade. Went home with Hattie to dinner. Later Birdie took us to a picture show. After supper Ott took us to ride. Letter from Lydia. Thursday May 7th 1925 Fannie & George took me to ride. I stopped at Coralville. Called at Mr Davis, Mrs Francis & The Garrits. I went up to the old house and got lilacs for Will. Had lunch in town. went to the cemetery. Was home by two oclock. At fine The Whetstones came and to me to Mrs Willis to a party. Fine day. Friday May 8th 1925 I was busy in AM. Wrote to Lydia. We went over to Hatties for dinner. Later some of the folks went to ride. I staid there till they came for me at supper time. A letter from Warner McCall. Evening at home.